... along the costal road. 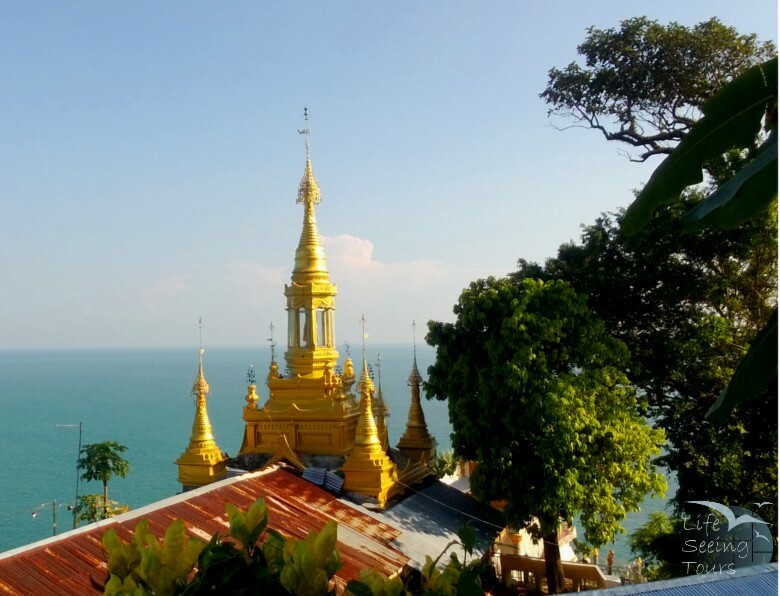 The Dawei Peninsula stretches from Nabule Beach in the north (Burmese: Mayingyi Aw) about 100 kilometers to the south and finishes at Dawei Point with Shin Maw Pagoda. Along this coastline there are maybe the best onshore beaches in Myanmar. The access to these splendid beaches is missing infrastructure, which keeps them unspoiled. It will be only a matter of time as various investors announced already building plans. There are opportunities for jungle trekking and snorkeling, most of them are not yet discovered. The daily life on the peninsula seems to be pretty relaxed and the local people are very welcoming. Main industry is fishing, rubber plantation and rice paddy fields. It seems that there is a little wealth among the people as houses are in good shape and pagodas and monasteries nearly everywhere. From Dawei there are public buses a few times to the far southern end of the Peninsula as well as to the main beach of Maung Ma Gan. The most convenient way around is by a rented motorbike. The most comfortable way will be with a car and a driver. The best accessible beach is Maung Ma Gan Beach, which translated means “Where the king took his concubines”. Apparently one of the great kings did so after winning an important war. It is long beach stretch with various bamboo huts for dining. The water has a lot of sediment from the rivers, which makes it a little gray. Nevertheless it is very clean. The only really busy day is Sunday, when locals have some time off to enjoy the beach atmosphere, otherwise it is all yours. Coconut Guesthouse, which caters the best for foreigners, offers wooden and concrete bungalows. Great food, the best accessibility and awesome service. Located 750 meters from Maung Ma Gan Beach in Maung Ma Gan village. Maung Ma Gan Beach Resort offers clean bungalows with air condition and breakfast. The beer garden is a good hang out for an afternoon. The soundproofed karaoke rooms cater mostly for Asian tourists. Located a little to the south end of Maung Ma Gan Beach. DDPC Bungalows, which are very basic, but right on the beach. The surroundings are very quiet and it is hard to get there and get away. Located to the north end of Maung Ma Gan Beach. Nabule Beach is located to the north of Maung Ma Gan (15 km) and is very long and yellow to white sand beach. At the far north end is a little pagoda between the rocks. It is a very nice place to make a day trip from Dawei or Maung Ma Gan as you are passing rural countryside and villages. Motorbike and car accessible. 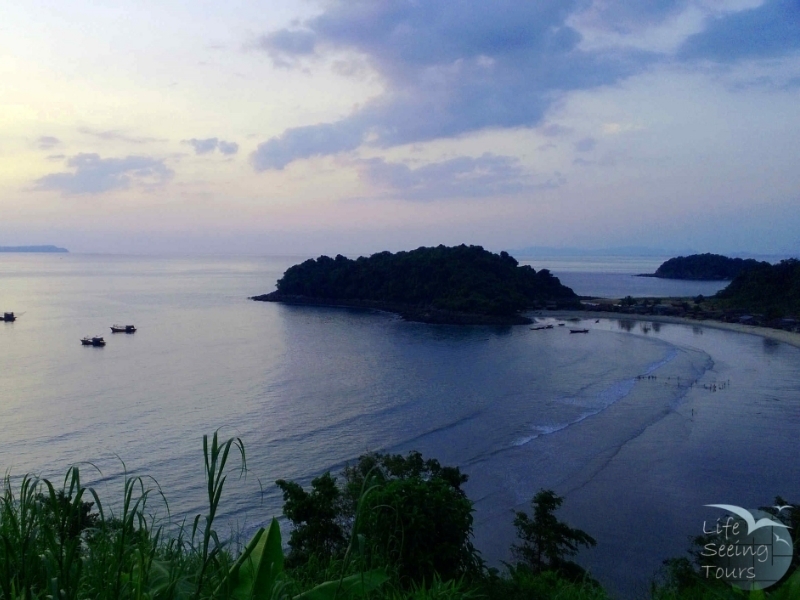 San Maria Beach is located south of Maung Ma Gan (13 km) and is equally beautiful to Nabule. At the southern end there is a lagoon, which fills up on high tide. On the sand banks there are a few temporary fishing huts. Great beach to swim b yourself. Motorbike and car accessible. People who are not beach bums will love San Lan Beach. Most part of the beach is covered by fishing huts. 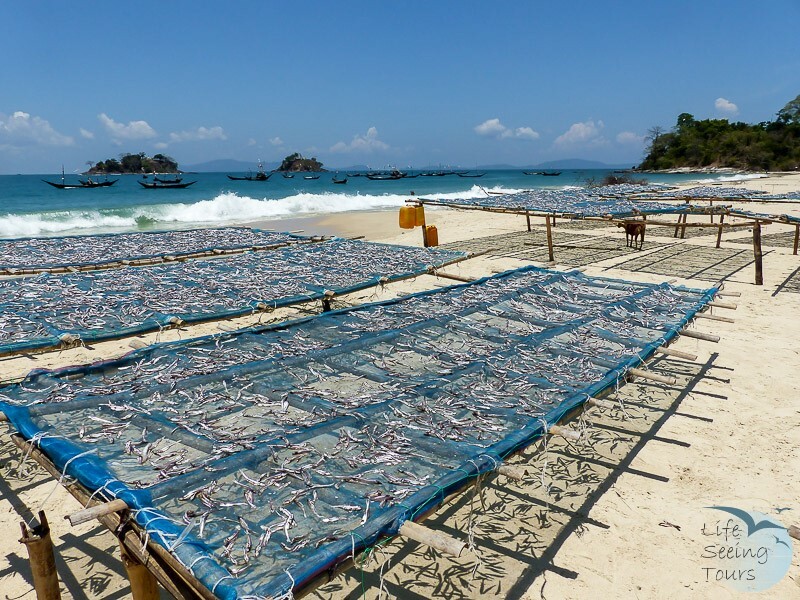 So get there early to see how they make dry fish and fish paste (seasonal). From Dawei (1.25 hours). Motorbike and car accessible. Tizit Beach it the best beaches accessible in a day ride from Dawei. It is a long white beach with a small fishing village to one site. A short walk to the north end brings you to another bay, with shady trees. The water around the rocks is perfectly clear enough. Be aware that you can be closed in on king tide (full moon) as you crossing a salt flat to reach these beaches. From Dawei (1.5 hours). Motorbike and car accessible. The grandfather’s beach named after nearby grandfathers hill (Burmese: Popo Gau) is a white beach stretch about 5 kilometers long. It is a dream beach with turquoise waters and nothing around you except jungle. From Dawei (2.5 hours). Only motorbike accessible. Myin Kwa Aw Beach is the horse shoe bay at the far southern of the peninsula. All the beauty comes together at this places. The white beach and clear water, the jungle and the nearby fishing village and the Shin Maw Pagoda (about 8 km). There is a little bit snorkeling to the left site of the bay. There are small bays around the beach, where trees offer shade to spend a day out of the sun. Myanmar Paradise Beach Bungalows at Zat Sar Aw Beach is currently the only licensed accommodation on the peninsula. The bungalows are tugged away under coconut palm tree and just a stone throw away from the water front. The bungalows are spacey, 8 sqm terrace, 10 sqm living room and 6 sqm bathroom. The white sandy beach and the turquoise waters make it a perfect place for vacation. The bay is without in habitants and the bungalows are surrounded only by jungle. Snorkeling can be done right from the beach. Quiet a few colorful fish, but only a little coral. It is the perfect place to pitch up a hammock and relay under shady trees. write your diary and finish reading your book. Access is only by boat (from Nyaung Pyin village) or foot (45, min) or motorbike. Local mini vans drive several times a day to the nearest village (45 min walk or 10 min by motorbike taxi). Be aware road is tricky you might want to walk and just got your luggage dropped. Life Seeing tip #1: Just rock up in a village and sit down for an ice sugar cane juice or a coconut. The cinema will automatically begin as locals gather around you. Life Seeing tip #2: Swim at night time as the peninsula offers all year around florescent waters. Shwe Mon Gan Restaurant on Maung Ma Gan Beach seems to cater the best for foreigners. The friendly lady is welcoming you with a charming smile. However most of the restaurants offer the same cuisine. Just look in their freezer what they have to offer. Yway - Thai and Burmese Food - Best choice to it on the Peninsula. Clean restaurant and fresh ingredients, cooked daily by Yway quickly in her open kitchen. Feel free to look in the pots to see what is available.